Mouse monoclonal Integrin alpha 5 antibody [SAM-1]. Validated in IP, IHC, Flow Cyt, ICC/IF and tested in Human, Macaque monkey. Cited in 5 publication(s). Independently reviewed in 2 review(s). NKI-SAM-1 recognizes the 135-kDa integrin- alpha5 monocyte-specific antigen. As a result NKI-SAM-1 strongly reacts with monocytes, and weakly with granulocytes, platelets and T-lymphocytes. Its exact epitope is not known. Integrin alpha 5 positive cell preparation. Integrin alpha 5 is a heterodimer that associates noncovalently with CD29/integrin beta 1 subunit to form the alpha-5-beta-1 very late antigen (VLA-5) complex. VLA-5 is a fibronectin receptor that is expressed on thymocytes, T-cells, monocytes and platelets. It is also found on very early B-cells and activated B-cells. VLA-5-mediated binding to fibronectin sends a costimulatory signal to T-cells and enhances Fc-gamma-R- and complement receptor-mediated phago-cytosis. It is also involved in monocyte migration into extracellular tissues. NKI-SAM-1 is a monoclonal antibody obtained by fusion of mouse myeloma cells with spleen cells from BALB/C mice immunized with U937 histiocytic lymphoma cells. Our Abpromise guarantee covers the use of ab6131 in the following tested applications. Flow Cyt Use 0.2-0.5µg for 106 cells. IP Use a concentration of 0.5 - 2 µg/ml. Integrin alpha-5/beta-1 is a receptor for fibronectin and fibrinogen. It recognizes the sequence R-G-D in its ligands. In case of HIV-1 infection, the interaction with extracellular viral Tat protein seems to enhance angiogenesis in Kaposi's sarcoma lesions. ab6131 at 1/200 staining human retinal epithelial cells by ICC/IF. The cells were permeabilized with 100% methanol and blocked with 1%BSA / 4% goat serum prior to incubation with the antibody for 30 minutes. An Alexa-Fluor ® 488 conjugated goat anti-rabbit IgG (H+L) was used as the secondary. 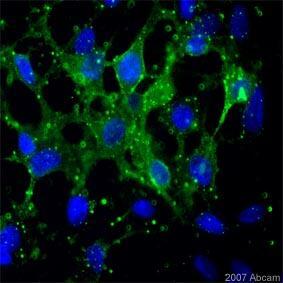 ab6131 staining Integrin alpha 5 in Human synovial fibroblasts by Flow Cytometry. Cells were detached by accutase, spun and fixed in 1,5 % formalin for 10 min. Gating was done on synovial fibroblasts. The sample was incubated with the primary antibody, dilution 1/500 (1% BSA in PBS), for 20 minutes at 25°C. A PE-conjugated Goat polyclonal to mouse IgG, dilution 1/200, was used as secondary antibody. The flow cytometry plot is an overlay of the isotype control ( IgG2b, red peak) with the sample (white peak); (equal amounts of isotype IgG2b and antibody were used). Publishing research using ab6131? Please let us know so that we can cite the reference in this datasheet. I apologise for the delay in getting back to you. I have been revewing and checking the immunogen sequences of our Integrin alpha 5 antibody. Regrettably, so far I am sorry I have not found one that would match your requirements on this occasion, to detect the amino acids 231-514 of integrin alpha 5. I am waiting to hear back from some external sources regarding one last antibody, hense the delay. As soon as I have this information, I will get back to you. In the meantime, if you have any further questions, please do not hesitate to let me know. Thank you for your patience.